The Metropolitan Opera is coming! Well, at least their sets are. Franco Zeffirelli’s production of Carmen will be presented at the Israel Opera in July, with a revival staging by Gadi Schechter and a cast of a few new, but mostly familiar, voices. We’ll also get to meet a new conductor, Karen Kamensek, who recently won the Olivier Award for conducting Philip Glass’s Akhnaten. Zeffirelli’s lavish operatic productions have been met with emotions on two extremes: there’s the camp that drinks up the rich detail and spectacular scenery, much of what you’d expect when going to see your first opera, and there’s the camp that deems it just that, campy: too traditional and too unchallenging to modern opera-goers. If you’ve never experienced a Zeffirelli production, it’s definitely worth a go – at the very least so you can make up your own mind. Bizet came to compose Carmen after suffering a series of failures in Paris, and had the Opéra-Comique not offered him a commission to write a second opera, a lot of opera’s most popular and recognizable melodies may never have existed. He and his librettists, Meilhac and Halévy, based the story mostly on a book by Prosper Mérimée, which described in great detail Romani culture – or at least what Mérimée imagined Romani culture to be like. Considering the opera’s popularity today, it might come as a surprise that Carmen was, initially, a bigger flop than any of Bizet’s initial attempts. The premiere in 1875 shocked audiences, who were horrified by the risqué plot, amoral characters, and violent ending. (To be fair, even Bizet himself calling the Toreador Song “garbage”.) The music disappointed almost everyone who heard it, and was accused of either being too Wagnerian or not Wagnerian enough. Later, on the opera’s way to glory, it acquired an unexpected champion: Friedrich Nietzsche. 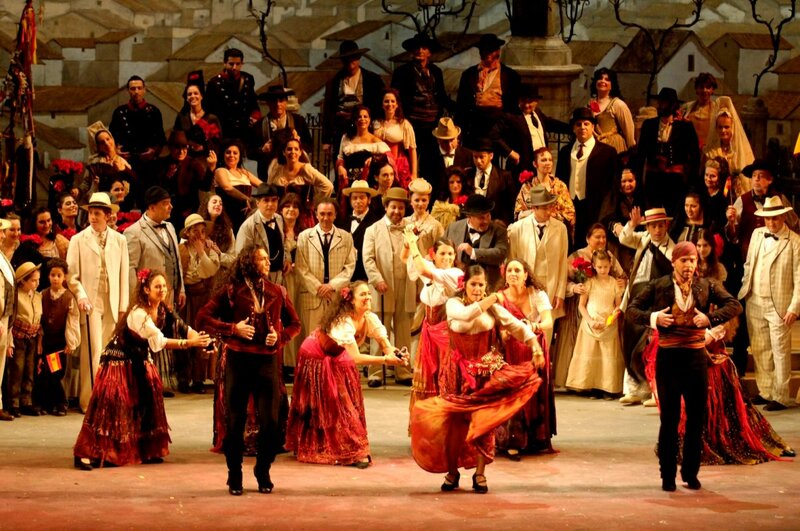 After Bizet’s early death, Carmen was revived across Europe and at the Metropolitan Opera in New York. In the 2017-2018 season, it is the second most performed opera according to Operabase. We’re sure that the Israel Opera’s upcoming production will be a much more successful run compared to the opera’s first one. In the title role, Russian mezzo Elena Maximova will be making her Israel Opera debut alongside our own Na’ama Goldman, who made headlines in 2012 when, as an understudy, she took over the role with a few hours’ notice when injury and the dry Masada air took not one but two Carmens out of the running. Israel Opera regulars Gustavo Porta and Najmiddin Mavlyanov will share the role of Don Jose, and two of Israel’s top soprani, Hila Baggio and Alla Vasilevitsky, will share the role of Micaela, Jose’s hometown sweetheart. As bad boy Escamillio, we have Dario Solari and David Bizic. Other soloists we know and love include Shiri Hershkovitz, Oded Reich, Noah Briger, Guy Mannheim, Yair Polishook, Yosef Aridan, and Vladimir Braun. There will be no Towards Opening lecture this time, but for anyone who wants to get a little glimpse into what goes into a production of this operatic giant, there will be backstage tours and Q&A “talkback” sessions on select nights: July 18, 19, 22, 24. Performances of Carmen start July 13 and continue through July 28. Ticket prices range from 190 NIS – 470 NIS and may be ordered online via the Israeli Opera website or call: 03-6927777.